If you’ve been following our site from the start, you know that we love the rustic-meets-modern works of Bates Masi + Architects. So you can imagine our excitement when we were told that this small but stunning retreat, just steps away from the ocean, is now up for sale. 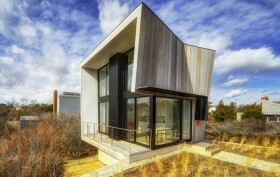 Simply named the ‘Beach Hampton House’, this structure situated on the shores of Amagansett is a study in geometry and space at just 600 square feet, and offers luxurious seaside living with a minimal footprint.